شناسایی های زمین‌شناسی مهندسی و برآورد پارامترهای ژئوتکنیکی مسیر تونل اهمیت زیادی در طراحی و اجرای موفق تونل‌ها دارند. شناسایی دقیق و کامل این پارامترها در محیط‌های شهری، با توجه به تشدید اثرات آسیب‌های ناشی از نشست و ریزش تونل‌ها اهمیت بیشتری پیدا می‌کند. شناسایی پارامترها و مخاطرات ژئوتکنیکی مسیر تونل‌ها در انتخاب نوع دستگاه حفاری نیز دارای اهمیت می‌باشند. شناسایی این ویژگی ها، یکی از چالش‌های مهم در تونل‌سازی است. تونل متوسلیان به طول حدود 10 کیلومتر در ادامه بزرگراه صیاد از شمال میدان سپاه تا بزرگراه آزادگان پیش‌بینی شده است که با توجه به امتداد شمال- جنوبی، به لحاظ شرایط زمین‌شناسی طیف متنوعی از واحدهای زمین‌شناسی را در برمی‌گیرد. به همین دلیل تخمین و ارزیابی پارامترهای مذکور پیچیده است. در این مطالعه روش برخورد با این پیچیدگی ها جهت رسیدن به ارزیابی قابل اعتماد از شرایط زمین‌شناسی و ژئوتکنیکی تونل متوسلیان با تعیین پارامترهای ژئوتکنیکی و شناسایی مخاطرات محتمل در مسیر تونل به‌عنوان یک تجربه مناسب مورد توجه قرار گرفته است. بر این اساس مسیر تونل با توجه به شرایط زمین‌شناسی به سه بخش شمالی، میانی و جنوبی تقسیم شده و ضمن معرفی تیپ‌های مختلف خاک به لحاظ پارامترهای ژئوتکنیکی، با تلفیق نتایج بررسی های صحرایی و آزمایشگاهی، بازه تغییرات پارامترها در هر تیپ خاک مشخص شده و در نهایت مشخصات مصالح هر تیپ جهت انجام تحلیل ها تعیین شده و همچنین مخاطرات محتمل در نواحی مختلف مسیر تونل بررسی و ارائه شده است. "تونلسازی شهری"؛ "ماشین حفری تونل"؛ "TBM"؛ "پارامترهای ژئوتکنیکی"؛ "شرایط زمین شناسی"
Engineering Geology and geotechnical parameters assessment is of the most important issues in successful tunnel design and construction operation. In urban areas, exact and complete reconnaissance of these parameters and site investigations are more critical as a result of the intensified effect of settlement and failure of the tunnels. Geotechnical parameters and hazards in tunnel route also affect the tunnel boring machine (T.B.M) selection and so they are challenging and very important issues. Shahid Motevasselian tunnel with a length of 10 Km. connects Shahid Sayyad Shirazi highway south wards (from north of Sepah Sq.) to Azadegan highway. There is a high geological diversity in geological units as a result of North- south direction of the tunnel and so it is too complicated to assess the parameters. In this study, as a good experience, the method of dealing with the complexities to achieve a reliable assessment of geological and geotechnical conditions is considered and also the possible hazards in different parts of the tunnel is determined. According to the geological and geotechnical situation, tunnel rout is divided to 3 distinct parts (northern part, middle part and southern part) and introducing the different soil types in terms of Geotechnical parameters, range of different parameters in any soil type is determined by combining the results of field and laboratory investigations, and finally, the material properties of each soil type determined as well as possible hazards likely in different parts of the tunnel route. "Urban Tunneling", "Tunnel Boring Machine", "TBM", "Geotechnical Parameters", "geological condition"
 Anagnostou, G. and Rizos, D. (2009). Geotechnical and contractual aspects of urban tunneling with closed shields. In: ITA-AITES World Tunnel Congress: Safe Tunelling for the City and Environment. City: Budapest, Hungary. Jerome B. O’Carroll, (2005). A Guide to Planning, Constructing, and Supervising Earth Pressure Balance TBM Tunneling. Parsons Brinckerhoff Inc, 146 pages. BTS, British Tunnelling Society in association with the Institution of Civil Engineers. (2005). Closed-Face Tunnelling Machines and Ground Stability: A guideline for best practice. Thomas Telford Ltd, London, 77 Pages. DAUB, ÖGG & FGU (2000). Recommendations for Design and Operation of Shield Machines. Tunnel, 6/00, 54-76. AFTES, French National Tunnelling Association, (2005). Choosing mechanized tunnelling techniques. Paris. Zhang, J., Boothroyd, p., Calvello, M., Eddleston, M., Canavate, A., Iason, P., Luo, Z., Najjar, S., Rodriguez, A., Straub, D., Uzielli, M. and Wang, Y. (2016). Bayesian Method: A Natural Tool for Processing Geotechnical Information. TC304 Working Group on “Discussion of statistical/reliability methods for Eurocodes”. Sahel Consulting Engineers. (2010). 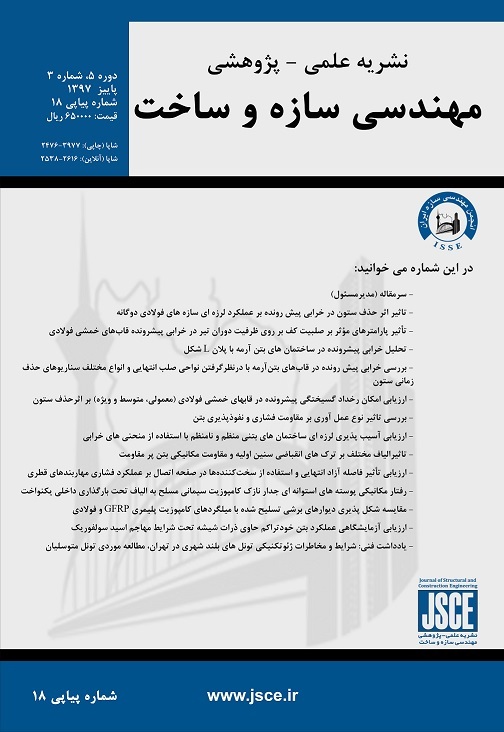 Final Report, Engineering services for 1st phase of geotechnical studies of Sayyad Shirazi tunnel. Tehran. G. Look, B. (2007). Handbook of Geotecnical Inverstigation and Design Tables, Taylor & Franklin Publication, the Netherland. Management and Planning Organization. (2000). Guidelines for pressuremeter tests (in geotechnical studies). Technical Office, First Edition, Tehran. Cashman, P.M. and Preene, M., (2003). Groundwater Lowering in Construction, John Wiley & Sons Publication, Hoboken, New Jersey. Bowels, J.E., (1996). Foundation Analysis and design, 5th edition, McGraw-Hill Publication.